What we all had failed to realize was that Teddy had deeply bonded with Donna and his off leash abilities were tied to not losing her. Teddy shot from door to window where he tried to jump from the second story. I grabbed him before he fell out and suddenly he was out the back door into the yard and around to the gate where he tried to push his way out. When that didn’t work, he was back upstairs pacing from window to window. At one point Donna returned for some reason and he managed to squeeze his way out another window covered with metal bars (tasteful Spanish style ones if you’re wondering). This poor little dog was frantically trying to get back to Donna, but luckily, Andrew had a calming effect on him and for the rest of the day, Teddy stuck by Andrew’s side or on his bed. I could tell this really made Andrew feel special and it started to seem like it might just work. Then we decided to take him hiking in Runyon Canyon, which is our local off-leash, dog friendly, hiking trail up in the Hollywood Hills. Heelers love to hike and we hoped this would help him see how great his new home would be. Even though it was almost six when we started, the afternoon heat was still fresh on the trail and showed signs of lingering for a while longer. We still took the more rigorous spine (Andrew’s favorite) and even though we kept him on leash, Teddy seemed at home and happy to climb and stayed right up with Andrew, leaving Truman and me behind. Just 10 minutes into the sun drenched hike I called for Andrew to wait for us at the lone shade tree for a water break. As I got out the portable water bowl and fumbled with my water pack to fill it, Teddy saw an opportunity and seized it. He bolted and started to run back down the hill. My first reaction was not the fear of losing him, but the dread of having to walk back up the hill again. I yelled at Andrew to pursue him as quickly as he could. Andrew shot down the hill so fast that I now imagined a trip to the emergency room as well. I, too, started down, asking people along the way if they had seen a little red dog. One group of hikers did see him, but it was not the trail he was on. They said that he had shot off the trail and straight down into the wilds of the canyon. My reoccurring dream was starting to come back to haunt me, only this was worse. To lose a dog is horrible; to lose your friends only connection to her recently departed brother was beyond tragic. Andrew finally came back up the hill and for the next three or four hours and even after the canyon’s heat gave way to darkness and coyote cries, we climbed the hills yelling out for Teddy to come back. People were kind and even one person tweeted it out on a special Runyon Canyon Tweet tree. Still, when we left the canyon, we left one dog short and with the burden of letting Donna know about the loss. I delivered the news. Perhaps, because grief had so overwhelmed her life for the last few weeks that Donna was surprisingly calm and resigned to Teddy’s fate. We were all sure that his 35 pound frame would not survive a night in a coyote filled canyon and went to bed with heavy hearts. One last thing I did before falling asleep was to post Teddy’s picture on the Runyon Facebook page at the suggestion of one kind Tweeter. The next morning I received a phone call from an unfamiliar number and area code. Hoping for a “I have your dog” call, I sprang for the phone. It wasn’t the call I so desperately wanted, but the man who ran the Facebook page on which I had posted. He informed me that he had alerted over 8000 fans and he would be in the canyon searching for a good part of the day. Later, he called back to let me know that one of the fans was the guy from The Bachelor and he tweeted Teddy’s loss to over 50,000 followers. Unbelievably, before noon there were around 100,000 people who had been alerted and news that many of the day’s hikers were calling out for Teddy as they made their way through the canyon. I got to work as well. I made posters and had them printed up at Staples. Once they were ready, Andrew and I took to the hills again. On our way up, we got another call from Jeff: Teddy had been sighted twice and in the same spot. He had been sleeping in the shade, but unfortunately nobody grabbed him and he was no longer there. Still, Teddy had survived the coyotes and the place he had been seen at was near water. When we arrived, we put up posters and began our search. Andrew and I scoured up and down the rocky terrain in the area where Teddy had been spotted. We searched through all the undergrowth all the while calling out his name. After a while, Andrew took off and for hours hiked up and down the canyon calling for Teddy. In the mean time, I had gotten hold of Donna and told her that Teddy had been seen, but not found. She said she would come, but by the time she got to the canyon it was almost dark and hope was running thin again. We finally reached the spot where he had last been seen, and Donna shot up the side of the canyon. Letting go of the calmness she had tried to approach this loss with, her real feelings for Teddy became apparent. She desperately screamed out his name and maniacally worked his favorite squeaky toy, all the while slipping on the loose rubble that the Manzanita and scrub oaks clung to on this precarious slope. Donna worked her way down the hill and came out of the shadows with Teddy right at her side. His leash was gone, but he was attached to Donna with a bond stronger than any leash could afford. We got him down to the water source and fed him handfuls of snacks that we had brought. As we walked, Donna said that she couldn’t leave him. I had suspected this might happen and was prepared for it. She had been through so many traumas that she just couldn’t leave her brother’s dog right now. During this whole exchange, I had failed to see Andrew walk off and get into the car. When Donna finally left, I found him sitting there in the dark. I could tell he had been crying. I did my best to explain what Donna was going through. If anyone could understand loss and what it can do to you, it was Andrew. I knew there was one more thing I had to do. “Yes, dad. I would,” came a soft reply. Andrew was mostly silent on the way home, but I chattered a bit about the prospects of finding a dog that would be a good fit for us. Coming soon: The Dog Days of Summer, Part III or Chasing Maggie. Pa amb tomaquet is really nothing more than bread and tomato with a cool Catalonian name. But for those who experience this simple dish at the peak of the tomato season, it quickly becomes a favorite light meal or snack. Although I can remember eating this regional dish from the Barcelona area while living in Spain twenty-five years ago, my most memorable Pa amb tomaquet was at a little restaurant in Portland, Oregon. Perhaps it was just knowing that nine months of rain was around the corner, but this little dish came to represent sunshine on a plate for me. It is really much more delicious than the sum of its parts and will easily become a favorite in your home as well. This is not a complicated nor detailed recipe, but good and fresh ingredients are the key. 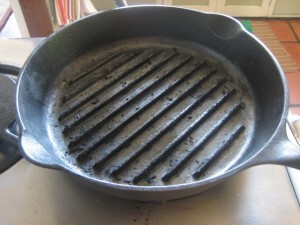 Toast the bread on a grill pan, or alternatively, toast the bread slices in an oven for 3 minutes at around 375 degrees. While still hot, take the garlic half and rub the cut side across the toast. Rub the underside, as well, if you really like garlic. 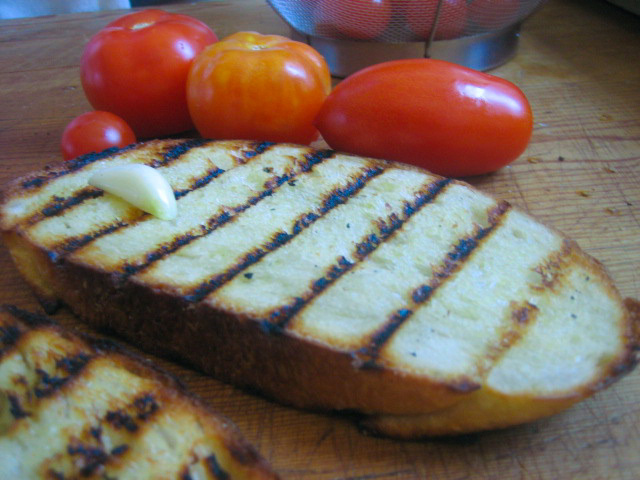 Next, cut a tomato in half and rub it across the toast, soaking the toast with the tomato juice and pulp. 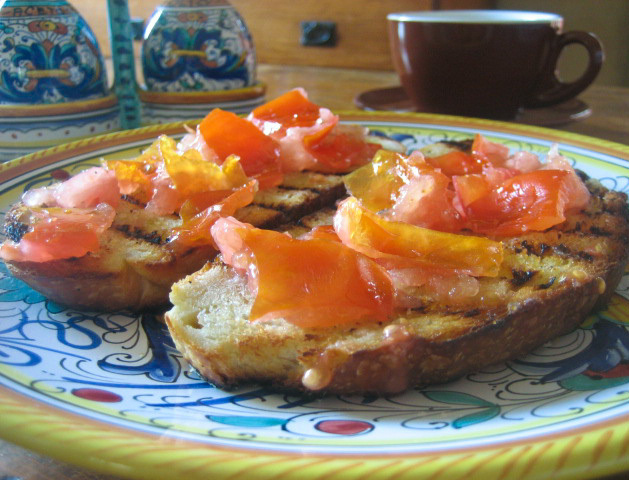 If the tomatoes are really ripe and soft, go ahead and crush them with your hands and top the toast off with the tomato pieces. Now, drizzle the bread and tomato with some olive oil (the better quality oil, the better quality Pa amb tomaquet), and then sprinkle it with a bit of sea salt or kosher salt. That’s it. Trust me, it’s brilliant. I can’t wait for the next installment. I’ll have my hanky ready. Nice work again Mr. Wilson! I hope Andrew finds the dog that is meant to be soon.